Your music always makes my concerts successful! The audience and students LOVE the music - THANK YOU! LOVE THIS MAGAZINE! I could teach all year simply using this resource! Thank you so much! Do you all ever rest? How do you come up with these amazing pieces time after time? To me, the hardest part of teaching is deciding what curriculum/songs, etc. to use, and Music K-8 fills a void. We are using Recorder Karate for our main method and the magazine [Recorder Classroom] for the rest. I have put off recorder until I found these publications and have loved our recorder program ever since. It is amazing how much easier students get some of the musical concepts now. It has added so much to their learning. Please don't ever stop writing songs which make me look good. You guys are all terrific. I absolutely love your publication. I tell everyone I can about it. I find myself grabbing it again and again for quality songs and fabulous orchestrations. It is imaginative and enriching in so many ways. It is the one resource that doesn't gather dust on my shelves! Thank you all. Your magazine and CDs are priceless. High quality and clever, there is always something I can incorporate into my teaching in every magazine, not to mention instant program songs! They can cut everything else from my budget (don't tell my school that), but don't cut my Music K-8 subscription! Thanks to Music K-8! At my concert last week, during "Shortnin' Bread," the most amazing, spontaneous thing happened. The audience started SINGING ALONG! Holy cow! They started singing out of PURE ENJOYMENT! I can't thank the Plankers enough for creating experiences like this, not just for me and my kids but for their parents as well! Later, a parent told me that she remembered that song from when she was younger and was thrilled to "re-remember" it! How awesome is that? 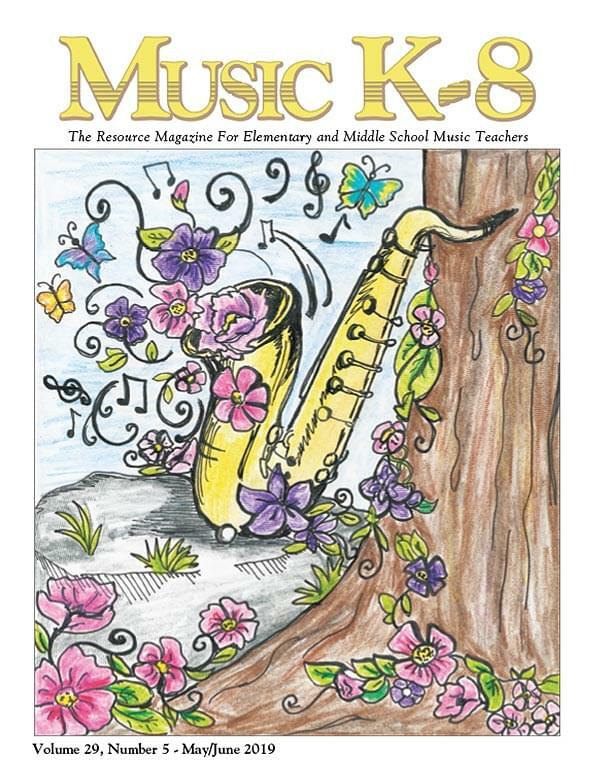 I am grateful that I am able to order your Music K-8 magazine each year because I use the songs for programs and my elementary chorus. Thank you for the awesome job you do in creating songs that fit what we need and for allowing a place to share ideas! Without Music K-8, I wouldn't be able to survive! Thank you so much! I want to thank you for your dedication to produce the quality resources that you do, as well as for the generous, cooperative approach that you have. I also appreciate the ease with which you can be contacted. The life of a music teacher using Music K-8 and other Plank Road publications is made so much easier... and in turn, the children’s love of music and music education is so much better and enjoyable! Keep up the fantastic work! I teach at a Department of Defense school. Some of our parents are deployed right now and we are getting ready for our Veterans Day performances, and I cannot possibly describe how much your songs mean to us. Even 5th grade boys are putting their arms over each others shoulders and swaying along to, "One Nation" (and that was their idea). The kids beg to sing songs over, even though it's time for them to go! When I told them we would have to narrow the program songs to just seven, they started to beg to, "Just make the program longer!" They actually cheer when I call out the next song! Every rehearsal is basically a patriotic pep rally. None of this would be possible without your beautiful songs! THANK YOU! Your company is the best resource any K-8 music teacher could have! You provide us with AWESOME music to teach to our students, and I hope that you can continue to do this for many, many years to come! I can't thank you enough for the support and encouragement you provide through your web site. Teresa Jennings continues to be my favorite composer to turn to when searching for a program to present to the community. Her music style is right in sync with this age group. Our music programs have been approved to air on our local school channel, and we've received numerous commendations for our work from the school board and the surrounding community. I gratefully acknowledge Music K-8 as the reason behind our success. Thank you just doesn't seem to convey how thankful I am for your support, but I'll say it anyway... THANK YOU! Music K-8 magazine has been a lifesaver and a huge resource to me. As a new teacher with my first year at an inner city, high poverty, high minority school with absolutely no music funding, I have come to rely on your magazine to provide me with program material, teaching resources, and great ideas. I constantly use the Idea Bank and message boards to try even more new things. I wouldn't have made it without all of the support and resources that Music K-8 offers. I could not put on the performances I do without Music K-8 magazine. That is the first thing I order. Thank you for such a phenomenal product. I have found your products and web site to be invaluable resources. The downloadable items are especially helpful. I have found Music K-8 to be a fantastic value. For the price of a musical from most other publishers, I get a musical, seasonal songs, the Idea Bank, the rights to make the copies I need for my students, and fantastic recordings. You can't find this kind of value anywhere else. Hmmm... let me just say: Music K-8 saved my career!!! I was on burnout mode about two or three years in, and someone told me about it. And it has been true love ever since!!! : ) WORTH EVERY PENNY!